Hello again and welcome to November! The year is certainly speeding by and as an autumnal treat to make the dark evenings that bit brighter, I’ve got a very special shoot to share with you. As a London wedding photographer, I’m privileged to work at some of the capital’s best wedding venues but, when it came to choosing a location for a this shoot, the Mandarin Oriental Hotel in Knightsbridge was the obvious choice. On November 26th, it will be 150 years since the publication of the famous Alice in Wonderland and to celebrate this literary milestone, a fabulous team gathered at the stunning Mandarin Oriental Hotel in London for a once-in-a-lifetime tea party. It was an exuberant, romantic and pastel-pretty shoot full of gorgeous details with a little touch of London. 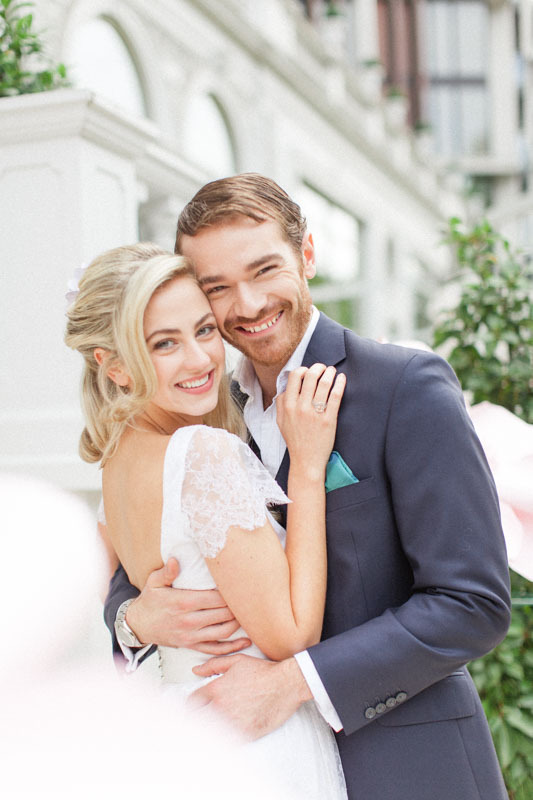 Wedding photography at the Mandarin Oriental is a dream for a London wedding photographer given the hotel’s amazing interiors, light rooms and enviable position near Harrods and our shoot certainly had the most fabulous backdrop. Charmaine James of Encharm’d is an incredibly talented wedding stylist and her work on the shoot was simply superb. I loved the pastel colour palette and all of the elements worked so perfectly together – it was a dream to photograph. Charmaine made sure that the pastels popped and every detail was impeccable. The centrepiece of any tea party has to be delicious cakes and desserts and highly acclaimed and widely published award winning cake artist Elizabeth’s Cake Emporium created the most delightful sweet treats for us. Embellished cupcakes and biscuits, macarons that even the Queen of Hearts would love made our tea table mouthwatering. The tiered cakes were perfect showstoppers – combining painted florals, teacups and exquisite decoration. Award-winning florist Amie Bone Flowers brought big blowsy blooms to the shoot that really took my breath away. The giant, tumbling table decoration might have been knocked over by a running white rabbit! The natural foliage coupled with pastel flowers and the luxurious golden vase was just outstanding. As a wedding photographer, I have a real weakness of charming flowers and I loved these. Whilst I’m talking about flowers, the paper flowers from Paper Flower Wedding were also fantastic. The paper flower backdrop would make a great touch at a wedding (imagine that as the backdrop for your photos!) and the oversized blooms on the chair backs also made a real impression. A Mandarin Oriental wedding would be even more brilliant with these! Knotted provided the stationery for the shoot and their designs worked wonderfully with the colour scheme and the whole look and feel of the day. And I can’t forget the team that made our couple look so stylish and wedding-ready. Make-up artist Erin Kristensen and hair stylist Lauren Smith worked their magic before our bride slipped into her Marianna Lanzilli gown from Heart Aflutter Bridal and our groom pulled on his Alexandra Wood Bespoke suit. Well, when you’re off to a celebratory tea party, you do need to look your best! Thank you so much to everyone who worked on our Alice in Wonderland shoot at the Mandarin Oriental and also a huge thank you to Wedding Chicks for featuring our literary celebration. I love to photograph London weddings and as a London wedding photographer, I know the capital inside out. I’d love to help you as you plan your wedding in London or in the UK and I’d be thrilled to be your wedding photographer. For more information on my London wedding photography, get in touch with me here. I’ll be back next week but, In the meantime, why not keep in touch on Facebook, Twitter, Instagram, Pinterest or Google+? See you all next Wednesday!